As a classroom teacher, you have an influential role in the lives of your students, not just in teaching them to be safe around medications now, but also in preparing them to be responsible future science consumers. Pharmaceuticals and medications are consumed by millions of Americans every day and have been carefully engineered, developed, and tested by research scientists for use in relieving symptoms and curing illnesses. We have enormous trust in the scientific research conducted by the medical establishment and pharmaceutical industries, but it’s important to be smart consumers of these products. 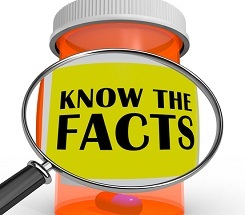 Misuse of medications is rarely intentional, but more often due to confusion and ignorance. Ignorance can be cured through education, and that’s where you come in. Information about the potential dangers of improper use of medications often seems to come in the form of words, words, and more WORDS – in writing on labels (I can’t even read these labels anymore without the use of, ahem, a magnifying lens). The text is frequently tiny and verbiage is long-winded and a bit overwhelming. This doesn’t lend itself well to appreciating the consequences of misuse because the words just sit there on the label very quietly and are easy to ignore or overlook. There are no videos, no before and after photos, no case studies or alarming statistics on the number of people who are adversely affected from misuse of the medication you’re holding in your hand. You might try a classroom experiment to demonstrate the potential harm that too much of a good thing can do. Try getting some inexpensive potted plants from your local nursery, such as tomatoes, peppers, or pansies. You’ll need at least three plants of the same species. You’ll also need some supplemental fertilizer to use in this experiment. Label one as your ‘control’, one as your ‘just right’, and one as your ‘too much’ experimental plant. All three of them will need to be watered, as appropriate, to make sure they don’t die from dehydration or overwatering. Place them together in the same location. 1) Your control will receive regular watering only. 2) Your ‘just right’ plant will receive the recommended amount of fertilizer listed on the package label. Have your students observe what happens to the plants over time. The control should remain alive and grow, but the well-fertilized plant (depending upon the effectiveness of the formula) should be more vigorous. Overdoing the fertilizer on the experimental plant should clearly demonstrate the consequences of too much of a good thing, as the plant will likely turn yellow, then brown and die. Explain to your students that medications we buy at the store, as well those prescribed by our doctors, are meant to help us when we’re ill, but if we’re not careful with them, they can really hurt us. The FDA lists some important steps for preventing accidental overdosing of medications, which you can share with your students (better yet, have your students come up with their own list and see how it compares with this one). 1. Always follow the directions on the Drug Facts label of your medicine. Many people feel that “some is good, more is better” thinking that if they’re not getting relief from the dose recommended on the bottle, it’s O.K. to take more. NEVER take more than the recommended dose, unless it’s approved by your doctor. 2. Know the “active ingredient” in the medicine. Many of us can’t pronounce the active ingredients, but they are always clearly labeled (FDA rules). 3. Know the difference between a tablespoon (tbsp) and a teaspoon (tsp). This lends itself well to a hands-on activity in the classroom; have your students measure colored water in dosing cups to see the difference in volume between the two. 4. Never take medicine prescribed for someone else. Dosing information on the label is provided for the person for whom it is prescribed. Possible drug interactions can happen for those taking someone else medications, or the dosing could be potentially too high. 5. Don’t mix multi-symptom relievers with other medications, including prescriptions. Unless you understand ALL of the active ingredients in ALL of the medications and the maximum dosage for each and have been directed by your doctor to take them – don’t. This is the biggest source of confusion and one of the most common causes of overdosing! 6. Store all medicines in a safe place. This is a critical lesson to instill in your students, especially if the parents are not being vigilant about it at home. Encourage them to talk to their parents about finding a safe place to store medications where they can’t be accessed by little ones.